"The water was coming through the electrical wire," Sgt. 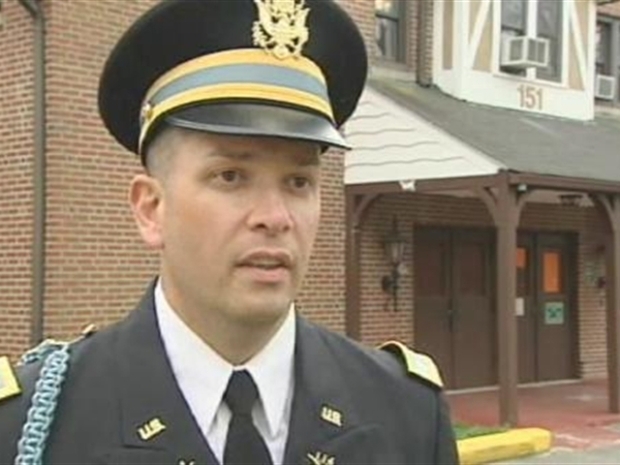 Gregory Gourgue, 41, of the New Jersey National Guard told NBC New York about what happened to his Ewing home while he served in Iraq a year ago. His mother and 14-year--old son had to move out. Sgt. Gourgue admitted he would have been up a creek without a paddle if it hadn't been for the New Jersey National Guard's Family Readiness Council. The nonprofit stepped in with a $2,500 grant to help pay to repair the waterlogged roof of his 75-year-old home. "Without the grant I would have to wait at least a couple of months to do the roof alone," Sgt. Gourgue said. Brian Thompson looks into a program in New Jersey has grown up with what's now our nation's longest war. The Readiness Council is almost as old as the Iraq war. Linda Reith, wife of New Jersey National Guard Adjutant General Glenn Reith, started it as a way to help families of guardsmen who were being shipped overseas to buttress an undermanned army and Air Force in both Iraq and Afghanistan. Since then, it has raised and given away roughly $1.2 million to Guard families in need. Bill and Terri Lancenese of Haddonfield got $4,500 from the Council. Bill, a Sergeant, was in Iraq when Terri called to tell him the furnace had died. It was November 2008 and she had a 2-year-old daughter to take care of. "I just kind of sat there looking at the ceiling and said 'God help me please,'" Terri said. But the Council's Jane Hackbarth and the Guard's Marie Derling stepped in, and soon thereafter the Lanceneses had a new furnace. "The war I gotta deal with, my everyday job and I gotta worry about what's going on at home. It's a lot, it's a lot," said Sgt. Lancenese, describing his emotions before the Council came through. The Council also offers grants to small businesses owned by Guardsmen. Lt. D. W. Janszky got an $8,000 grant for the floral shop he's owned for eight years in Haddonfield. The money helped his cash flow in the middle of a recession as employees were doing double or even triple duty while the boss was away. "I was ecstatic to think about the kind of support that was available for my business," Lt. Janszky said.